I’ve never been a bath person, but I’ve always wanted to be. I blame Instagram. The pictures of gorgeous bathrooms with greenery hanging all around, and a bathtub filled with what you can only imagine to be the most aromatic bath salts, makes me want to be a bath person. I never did find the perfect soaking tub to fit in our new space, but that hasn’t stopped me from becoming a bath person. In the past couple of months, I’ve suddenly had the urge to soak. 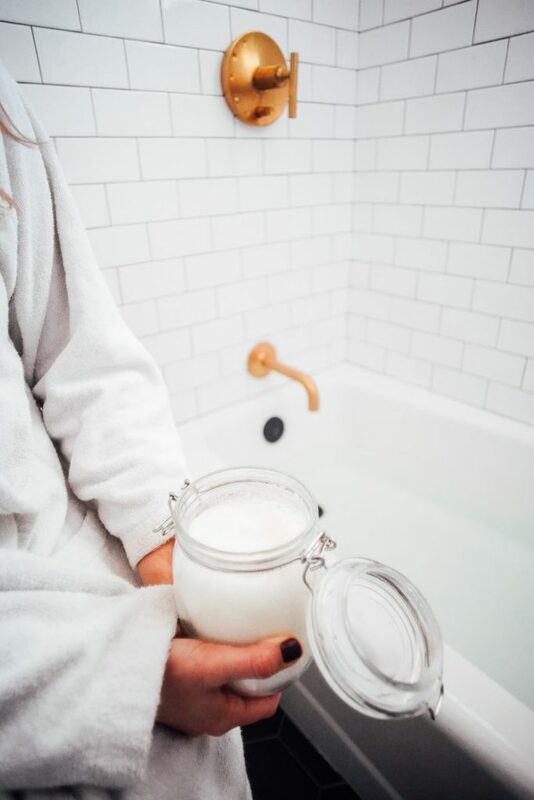 There’s something about putting the kids to bed, filling up the tub (even if it’s on the smaller side), adding bath salts, pouring a glass of wine, and dipping my toes in the warm bath water. It’s just the relaxation this mom needs in life. Truth be told, my love for baths started after I bought some bath salts from Pursoma. 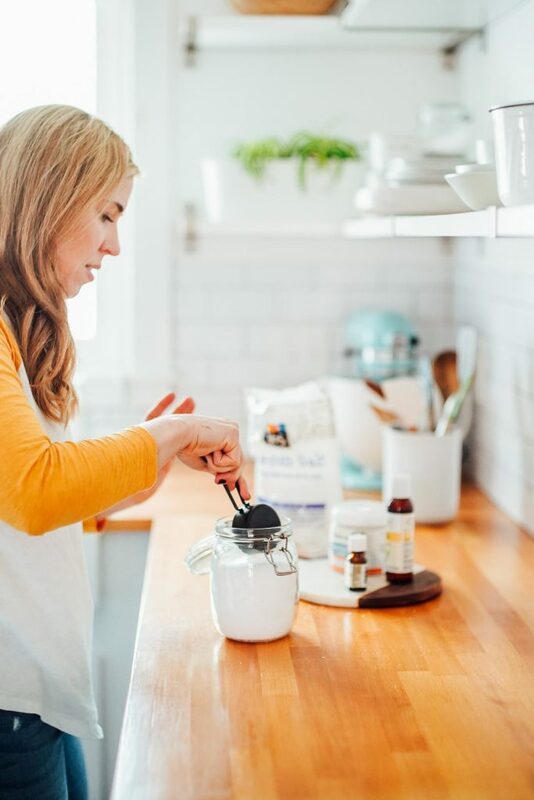 This company makes a variety of lovely bath salts with super clean ingredients: salt, herbs and/or essential oils, and clay. I absolutely loved the experience of their bath salts (and I highly recommend this brand if you want a store-bought option). Since the ingredients are simple, and I already owned most of them, I decided that going forward I would create my own bath salts experience. The following week, I did exactly that. Let’s make some homemade bath salts! I decided to Google this very question just to see what’s out there. Turns out, bath salts can be a drug that people take to get high. I know…what?! 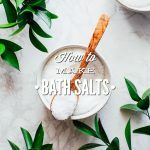 So, just to get it out there, this post isn’t about that type of “bath salts.” What I’m talking about is a mixture of salt and (optional) an essential oil. This mixture, referred to as bath salts, is added to warm bath water with the goal of soaking your body for a set period of time. This is the world wide web and people search for some crazy stuff, so I’m just putting that out there. We’re all on the same page now, right?! Why Take a Bath with Salt? Bath salts are incredibly easy to make and cost-effective. At this point, I choose to purchase most of my skincare products versus making products (you can read the details of my skincare routine, here). Bath salts are one product that I can’t help but make myself. It only takes a couple of minutes to make a quart-size jar. They’re also a great gift to make and give out during the holidays. Pair the salts with a bottle of wine and you have the perfect teacher gift. Soaking in bath salts can be incredibly beneficial from a wellness perspective. 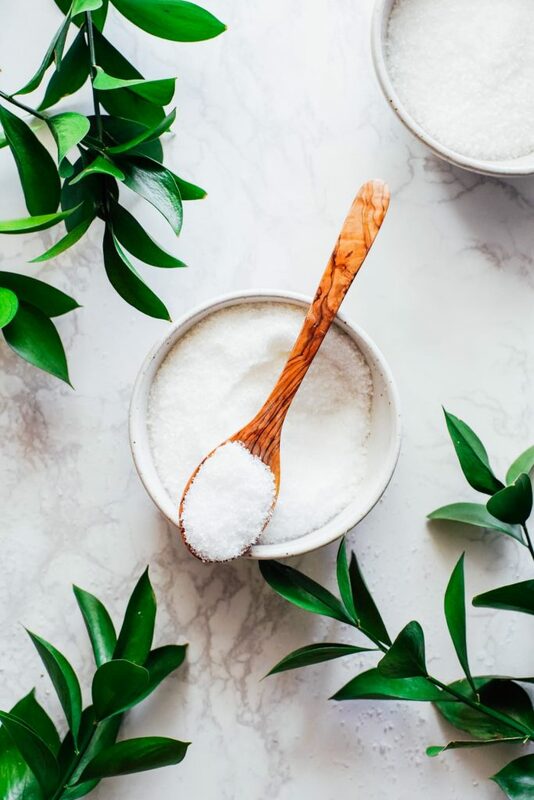 First and foremost, bath salts are a vehicle to help you relax and disconnect from the world and your phone, which means saying good-bye to stress (at least for 20-30 minutes). In a time when we’re constantly stimulated, taking 20-30 minutes for a bath is incredibly relaxing. Try it, just once. I think you’ll find this benefit alone is worth a soak in the tub. What Do I Need to Make Bath Salts? You can use either epsom salt or sea salt to make to bath salts, or you can use a combo of both. 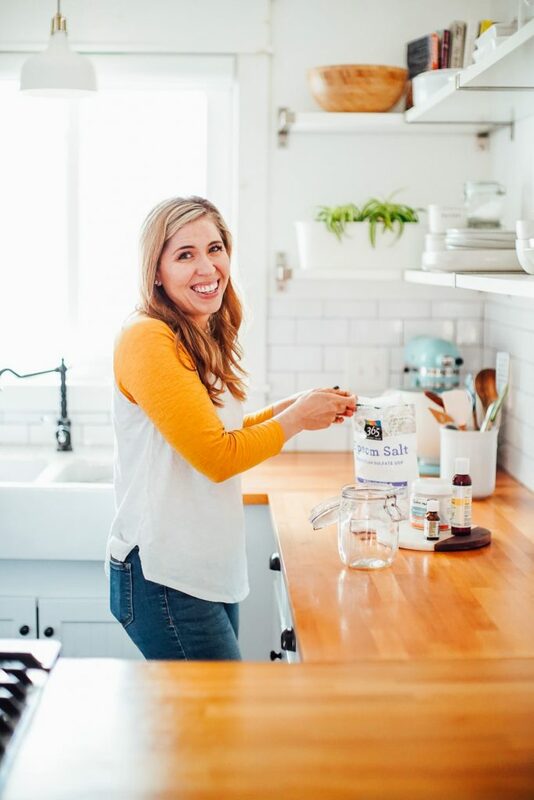 Epsom salt is not technically a salt like sea salt; rather, it’s a mineral compound of magnesium and sulfate. Epsom salt is commonly used to ease muscle soreness and calm tension. Epsom salt is easy to find at most stores. Bags or boxes are usually sold in the supplement section or near the pharmacy. Sea salt (not table salt) is rich in naturally-occurring minerals. Bathing in sea salt may help restore drained minerals that are essential to the body. Sea salt can be found in most stores. Personally, I usually go with epsom salt to make my bath salts. But I’ve also experimented with half sea salt and half epsom salt, or just 100% sea salt. The choice is up to you. Go with the option that you enjoy the most–this may take some experimenting, or you may want to go with both. Along with epsom salt and/or sea salt, you can add an aromatic experience with essential oils. You can also create this experience with dried herbs, but I’ve found herbs to be an annoying addition because the tiny bits stick to the bathtub after draining the water. Leftover bits mean that I have to now clean my bathtub, after a relaxing bath. See the irony in this? 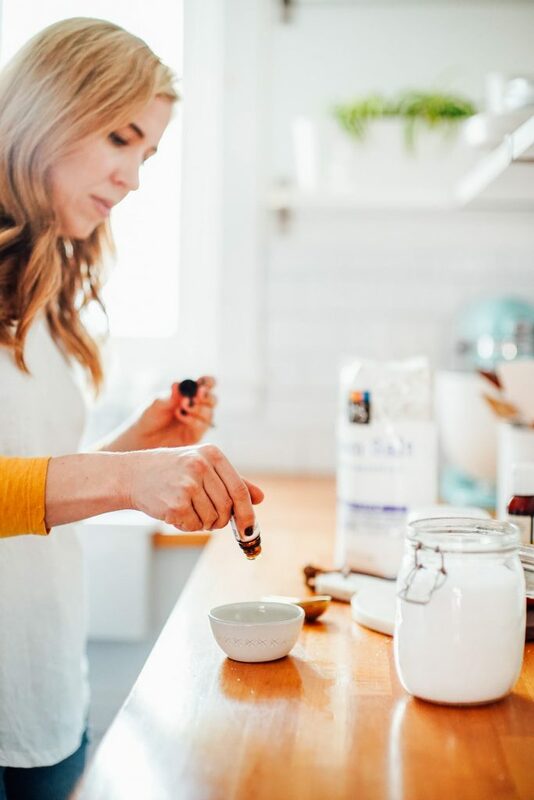 You can go with one single essential oil, a combo of essential oils, or a blend of oils (such as the blends from Plant Therapy or your favorite essential oil company). I usually go with a single essential oil, like lavender essential oil (relaxing and promotes restful sleep). Other single essential oil options: orange, frankincense, bergamot, eucalyptus, and rosemary. Avoid essential oils that can irritate or burn the skin, such as: cinnamon, oregano, peppermint, and clove. If you’re going to use the bath salts around a child (or for a child’s bath), keep in mind that some essential oils are not safe for kids (this chart is handy for reference). It’s best to err on the side of caution. Plant Therapy labels essential oils that can be used around children as “kid-safe.” I find this incredibly helpful and it’s one of the reasons I love this particular company (they aren’t an MLM and I don’t work with them–it’s just my personal preference when using an essential oil). It’s important to dilute the essential oils used in your bath salts. It doesn’t matter what brand you use, you need to dilute, dilute, dilute. We’re talking about very potent substances. Natural, but also potent. So let’s talk about what you need to dilute the essential oil(s) for safe usage. 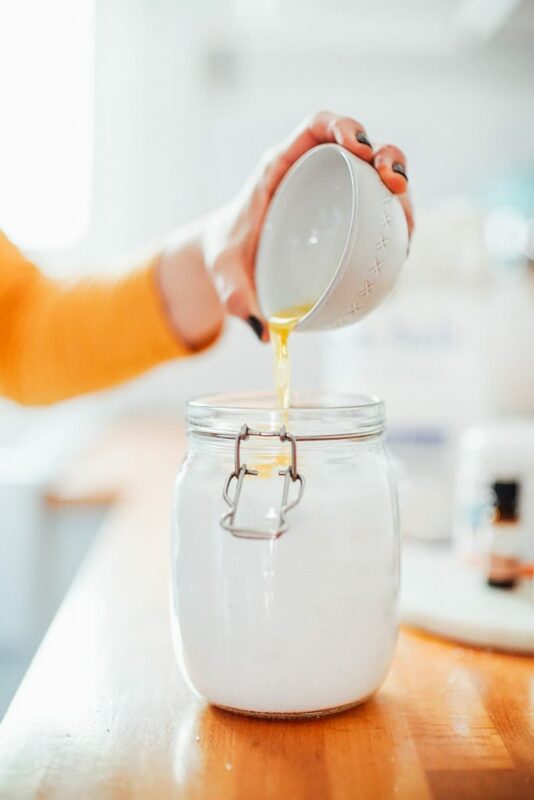 If you want to add the aromatic benefit of essential oils, which just takes the bath to the next level, mix the essential oil(s) with a carrier/nourishing oil, such as: olive oil, jojoba oil, grapeseed oil, or sweet almond oil. 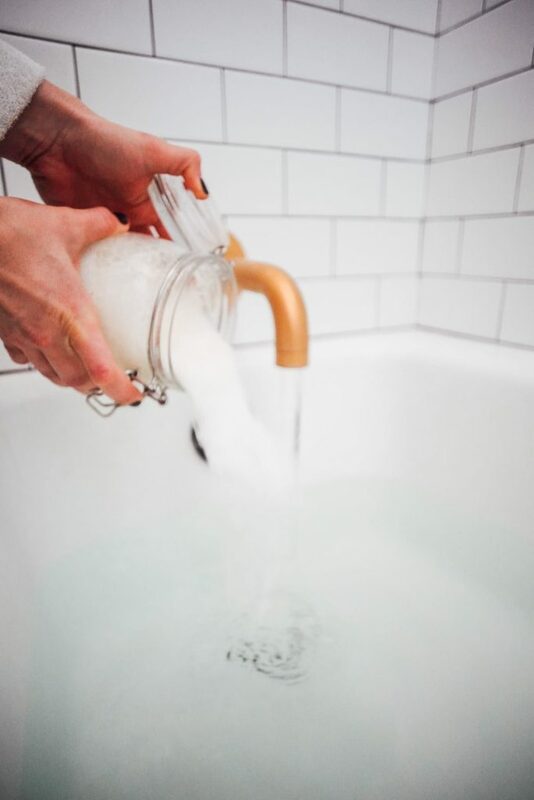 This step helps the oils disperse evenly throughout the bath water (once you take a bath). 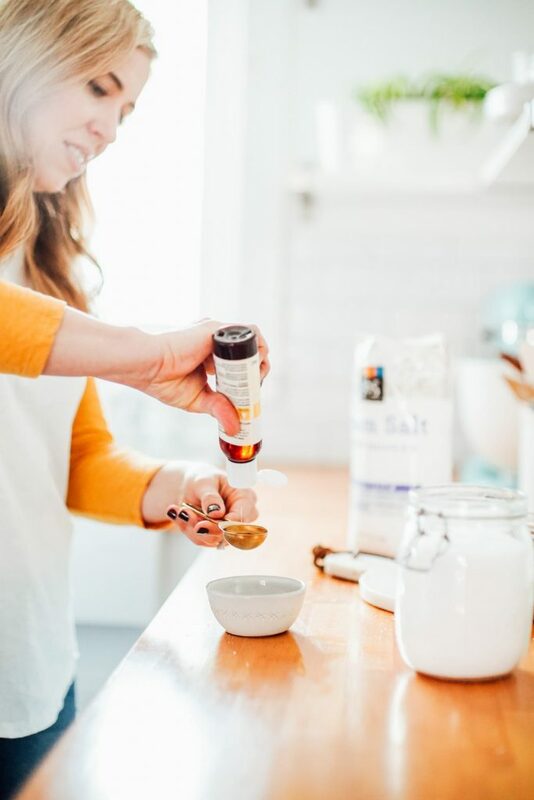 Once you have your ingredients: salt of choice, essential oil (if using), and a carrier oil (if using an essential oil), it’s time to mix everything together in a jar. Use a glass jar with an air-tight lid as the bath salts will keep for a year. Of course, you’ll most likely use your salts much sooner. The recipe shared today makes 4 cups of bath salts (1 quart-size jar). That’s enough for 2-4 baths. I like to add around 2 cups per bath, but you can go as low as 1 cup. The bath salts should fully dissolve in the bath. You might need to use your hands to help swish the salts around until fully dissolved. When using bath salts, try to soak in the tub for about 20-30 minutes. That said, do what works for you. The goal is relaxation and stressing out about timing isn’t going to help you get in the zen zone. For my children, I always make sure the salt has fully dissolved before they’re allowed to get in the bath. And I only use 1 cup of bath salts per bath. I find that evenings are the best time for a soak in the tub. After all, the goal is relaxation and nothing says relaxation quite like slipping into bed after a bath. I love taking a bath once a week, but that could all change. Do what feels good–maybe that’s once a year, maybe that’s never, or maybe that’s twice a week. Once the bath is over, I don’t rinse off. I go from bath to robe (I became a robe person this year, thanks to the hotel rooms in Europe being stocked with robes) to pajamas to bed. If you want to rinse off in the shower after the bath, more power to ya! 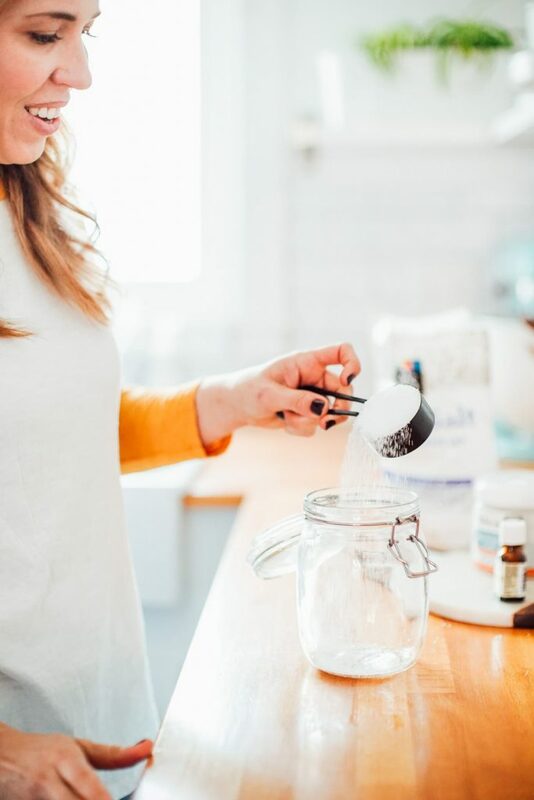 Now that we’ve talked about the specifics of making and using homemade bath salts (that was quite the long chat about something so incredibly simple), let’s make some homemade bath salts. I think you’ll love them! How to make your own custom bath salts and use them to create a relaxing bath experience. Pour the salt of choice into the storage jar. In a small bowl, combine the nourishing oil of choice and essential oil of choice (between 5-20 drops, depending on aroma desired). Pour the oil blend into the bath salts and carefully stir to blend everything together. Seal the jar and store away from direct sunlight. To take a bath using your homemade bath salts, fill a bathtub with very warm water. Of course, use common sense when it comes to the temperature of the water. While the tub fills with water, add your bath salts. (The essential oils will begin to evaporate in the warm water when you do this, but I find they're still worth adding to the bath salts.) I like to add around 2 cups per bath, but you can go as low as 1 cup. The bath salts should fully dissolve in the bath. You might need to use your hands to swish the salts around until fully dissolved. I usually go with a single essential oil, like lavender essential oil. Other single essential oil options: orange, frankincense, bergamot, eucalyptus, and rosemary. Avoid essential oils that can irritate or burn the skin, such as: cinnamon, oregano, peppermint, and clove. 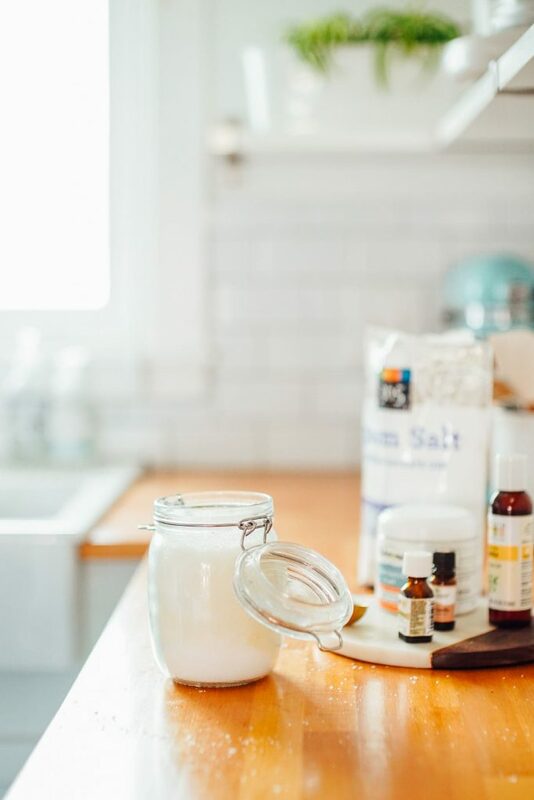 If you're going to use the bath salts around a child (or for a child's bath), keep in mind that some essential oils are not safe for kids under certain ages. It's best to err on the side of caution. This post/chart is a handy reference. Interesting post! Gonna try this.